Get ground in dirt out of your tile and grout. Grout and many types of tile are porous. 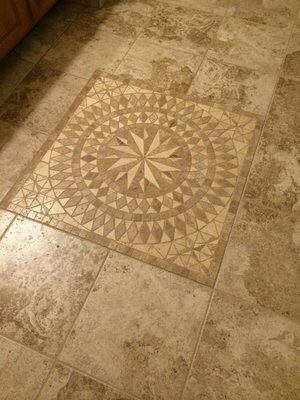 Millions of little holes, divots, and other surface features, which trap dirt and debris, causing your beautiful tile work to become dark and dull over time. Pressure puts force of dirt particles breaking them free of surfaces. Pressure also cause turbulence that gets into crevices to flush out tough dirt. Another word for the turbulence is agitation. Heat is excellent at freeing dirt by melting grease and oils that can bind dirt to a surface. Water is fantastic at dissolving many types of filth freeing it for immediate removal. And to be more effective, the water is mixed with a cleaning detergent to dissolve grease and oil and bind to dirt. Extraction finishes the job by quickly removing dirty water before the dirt can settle. Together, water, heat, detergent, pressure, and extraction makes for quick and thorough cleaning.